It is a known fact that the state of education in the tribal and rural pockets of India is abysmal; factors such as poor school buildings, scarcity of teachers, teacher absenteeism and poor communication are widespread, leading to high dropout rates in these regions. Despite the enactment of the Right to Education Act and the entitlements it brings, the people in these regions are deprived of this fundamental right. Yet one of the most critical elements of the agenda of democratic governance for 2015 is to ensure certain minimum standards of literacy for all. While governments have initiated the process of setting right the anomalies in the education sector, paving the way for several studies and research, essential gaps are yet apparent, primarily in implementation mechanisms. The challenges are many: lack of adequate physical infrastructure, lack of adequate learning resources of requisite quality, effectiveness of teacher training programmes. The lack of literacy in turn fuels several problems, such as gender exploitation, underlining the pressing need to accomplish the goal of education for all. The National Policy on Education, too, asserts that education is an indispensable necessity for women’s equality in the long run. It emphasises that education needs to be employed towards basic social change and towards neutralising the disharmony between genders. 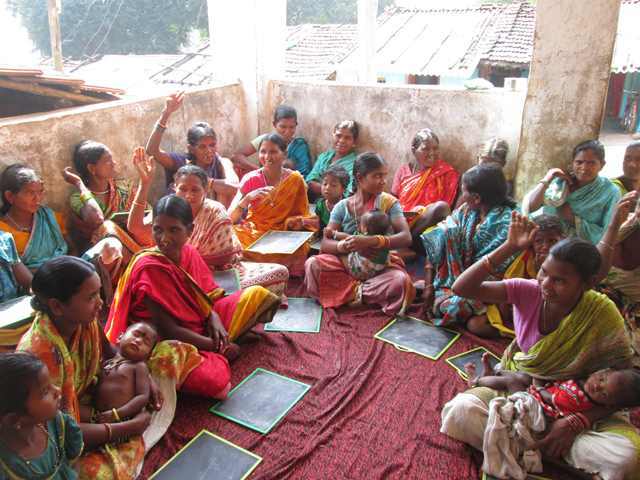 It is in this context that the State Resource Centre for Adult and Continuing Education (Agragamee), Rayagada, with the support of the Ministry of Human Resource Development, Government of India, launched the “‘Community Based Functional Literacy Camp,’’ (CBFLC) in three districts of Odisha, namely Rayagada, Kalahandi and Koraput, between January and March 2014. While selecting the villages and panchayats for running the pilot CBFLC, factors such as remote location, poor literacy status among women and poor access to government services and delivery were considered, all of which were manifest in the three chosen districts. The main objective of the CBFLC is to provide functional literacy to women and girls above the age of 15 years, including drop-outs, in the targeted tribal regions. Ushabali, a village under the Mandibisi Gram Panchayat at Kashipur block (Rayagada), consisting of 32 Kandha community households, became the first village where the CBFLC was conducted for 45 days. During the initial consultations and sharing of information with the community on basic objectives of the CBFLC, the women were found to be hesitant and remained more or less reticent. They cited their hectic schedules entailing household chores, collection of non-timber forest products and agricultural work – all of which form the mainstay of their livelihoods – as the reason for their reluctance to participate. Eventually however, after persistent efforts, varying responses were worked out in line with their diverse situations and constraints. It was decided unanimously that the literacy camp would be held from 8.30 to 11.00 in the mornings during the 45 days of scheduled workouts. Matriculates Sangeeta Majhi and Rabindra Majhi, both from the same village, were selected as Volunteer Teachers (VTs). The VTs were drawn from similar communities, spoke the native dialect and understood local realities well, so that they could play a crucial role in inspiring learners to hang on to the mission. On 8 January, the CBFLC was formally started at the Community Hall of Ushabali village, with 31 women and 7 drop-out girls. Apart from learning basic literacy, the women would also discuss their problems and issues of concern and possibly arrive at concerted decisions to resolve those. A wholesome meal, prepared by the participants themselves, was part of the sessions. There were also provisions for occasional evening literacy classes, when they could interact with block and district level officials. Apart from language and numeric literacy, the CBFLC focussed on a range of thematic areas, to build up legal, financial, electoral, disaster management and Civil Defence literacy. For example, as part of the legal literacy component, the women were made familiar with their fundamental rights and duties, the laws related to women and socially disadvantaged castes, and their entitlements under these. Under financial literacy, they were provided basic knowledge on household expenditure and savings, household micro-enterprises, investments and thrift habit formations. The participants were made aware of the importance of voting, and equipped with a vision related to precautionary and alert mechanisms for natural disasters and other emergencies, as well as management of situations during and after such disasters. “Saakshar Bharat offerings” would enable neo-literate adults to continue their learning beyond basic functional and numeric literacy, and help them acquire equivalence with the formal education system. An interesting feature of these literacy camps is that no formal books were employed; participants are encouraged to learn from their day to day experiences and traditional knowledge, writing alphabets and numbers with chalk, under the guidance of the volunteer teachers. Key Resource Persons and other personnel of the State Resource Centre (Agragamee) have been regular visitors to these camps, enlightening the targeted groups with their inputs and insight. A major achievement of the CBFLC so far has been in imparting effective essential training to participants on filing petitions/complaints, filling up applications for opening of bank accounts, money deposits/withdrawal, PDS cards, Job cards and the like, as well as completing formalities necessary to avail entitlements under pro-poor acts, schemes and programmes meant for the tribal and rural population. This is done with the help of Key Resource Persons, who interact with important government functionaries, teachers etc. ‘Kalajatha’, a traditional form of folk theatre, and street plays telling local stories using local examples, have served to spread awareness in these regions on the importance of literacy, functional living and health and hygiene. This has created a lot of interest among the targeted audiences of Rayagada, Kalahandi, Koraput and Nabarangpur districts of Odisha and has served to propagate basic environment and life skills education. The success of the Ushabali CBFLC has also provided much-needed inspiration and motivation for the personnel in the State Resource Centre. Following the experience, efforts were launched to initiate 45-day camps in other remote panchayats. On 5 February 2014, the second CBFLC was started in Adri, a remote Gram Panchayat, where less than 10 per cent of women were literate. 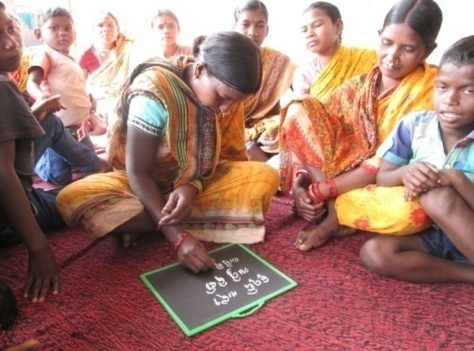 Another CBFLC was launched on 12 February 2014 in Bhitarbagiri village in Koraput district. A total of 148 neo-literate participants, including 39 drop-out girls, were trained at this camp. After the initial progress of the CBFLCs in the three districts, it has been found that a demand for the same has been generated in the neighbouring villages and gram panchayats. There have been several instances where they have approached Agragamee with a request to launch CBFLCs in their areas. Perhaps, the greatest beneficiaries have been the drop-out girls, as one finds in them a new firmness of purpose and resolution, a feeling of ownership in community decision-making and a share in governance. This has the potential to bring about sustained changes in the mindset of the rural, tribal people with respect to literacy, education as well as gender sensitivity. The author is Program Coordinator at the State Resource Centre for Adult and Continuing Education (Agragamee), Rayagada, Odisha, India.